Again, this is not rare or expensive, but quite an unexpected find during a visit to the city of Melbourne in Victoria, Australia. We were visiting and had to go to the ubiquitous IKEA store for a few bits and pieces and called into a large shopping centre complex in the Melbourne suburb of Richmond. It’s always hard to resist the opportunity to stop by local bookshops too, and when we spied one in this complex (it was part of the Dymocks national chain) we ducked inside and headed straight to the “Music” section. 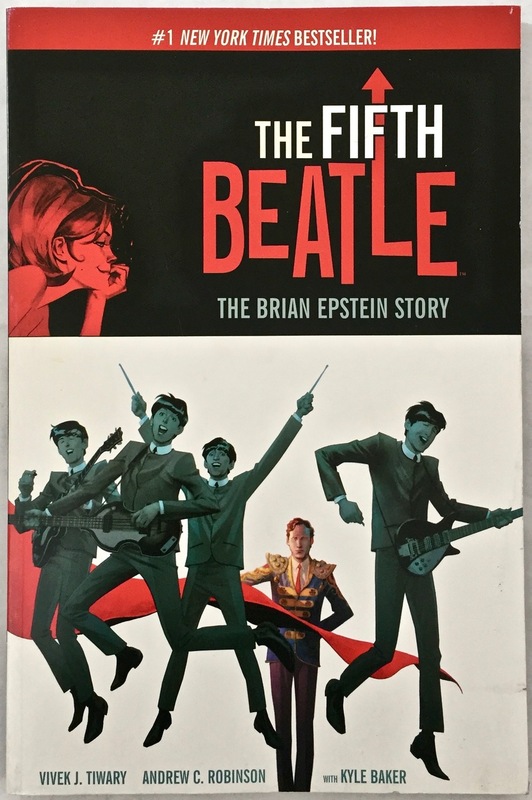 Now, The Fifth Beatle isn’t exactly a common book, especially in the wilds of Richmond, and even more so to be stocked by a large national chain of bookstores. You’d be more likely find something like this (maybe) in an independent or specialty store – but there it was on the shelf. 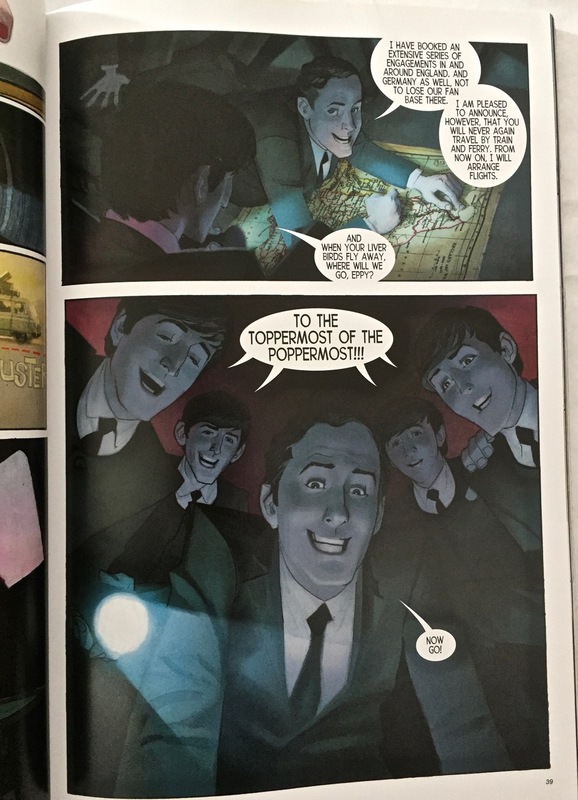 As you can see above, this is a very clever telling of the story of the rise of The Beatles, under the direction and tutelage of their clever, ambitious, talented and visionary manager, Brian Epstein. 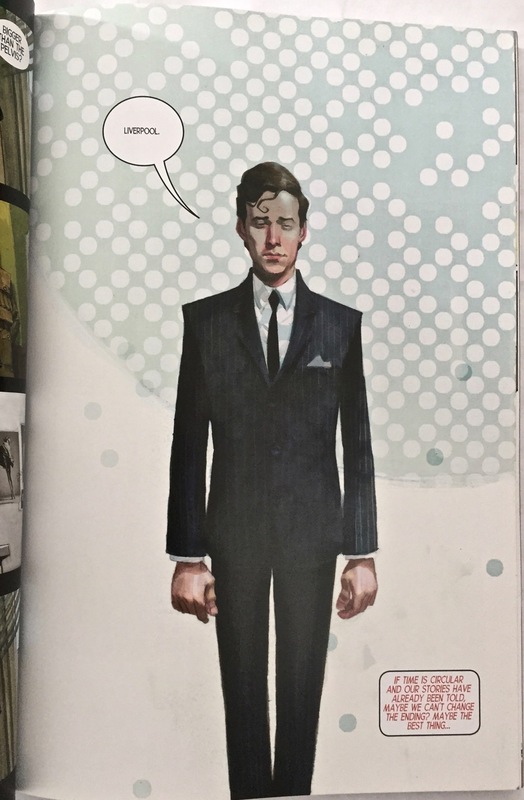 The Fifth Beatle reveals a man who took his charges to the very top of the world and attained what could be regarded as the ultimate in success, but who died painfully young – and tragically alone. 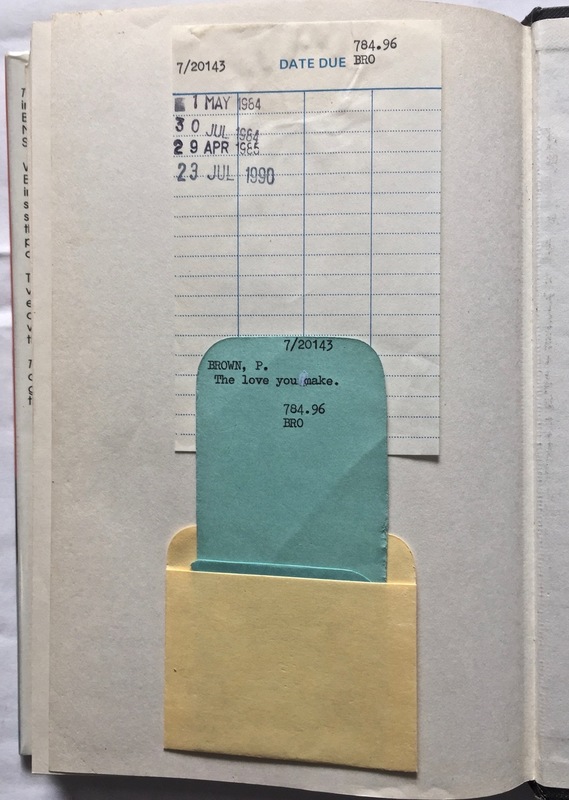 Written in 2013 and originally published in that same year, there have been a number of iterations of the book in the ensuing years. 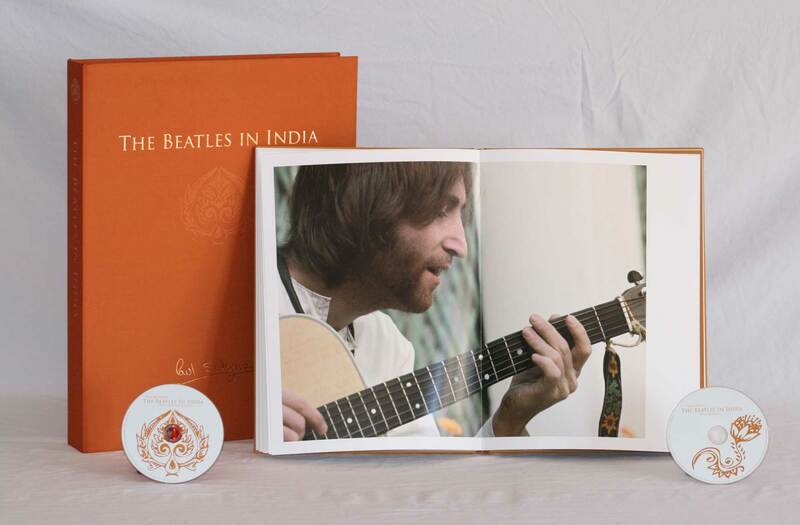 This is the 2016 softcover edition with an expanded sketchbook detailing the development of the project and a Beatles memorabilia section at the rear. This site has a “Look Inside” feature if you’d like to see more of the story and the sophisticated, often elegant artwork. The official site also has a preview function available. The Fifth Beatle has been in (and back out) of production for the big screen on more than one occasion. The latest news is that a deal has been cut with Bravo for a TV series based on the book. Let’s wait and see what happens. This is a book we’d been keen on owning for some time and if you don’t have a copy it is well worth seeking out. It’s great to have it as part of the collection. 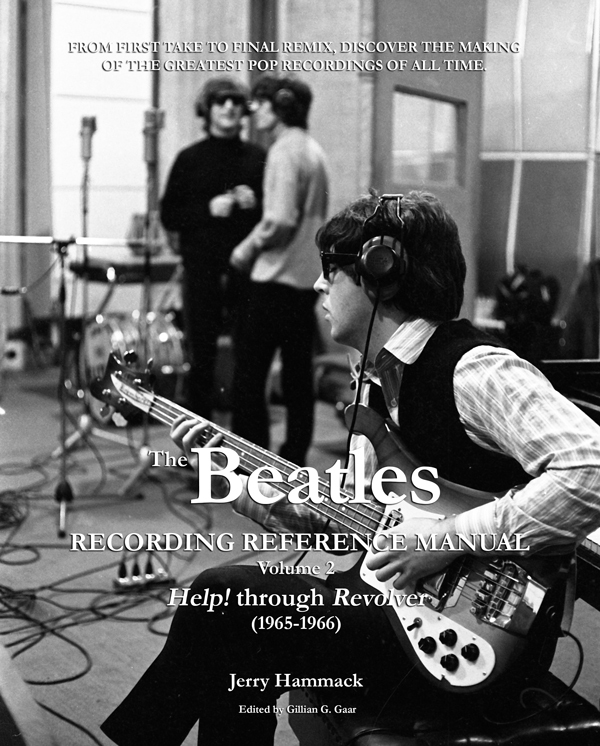 Now comes the next installment in his impressive series, The Beatles Recording Reference Manual – Volume 2: ‘Help!’ through ‘Revolver’ (1965-1966). 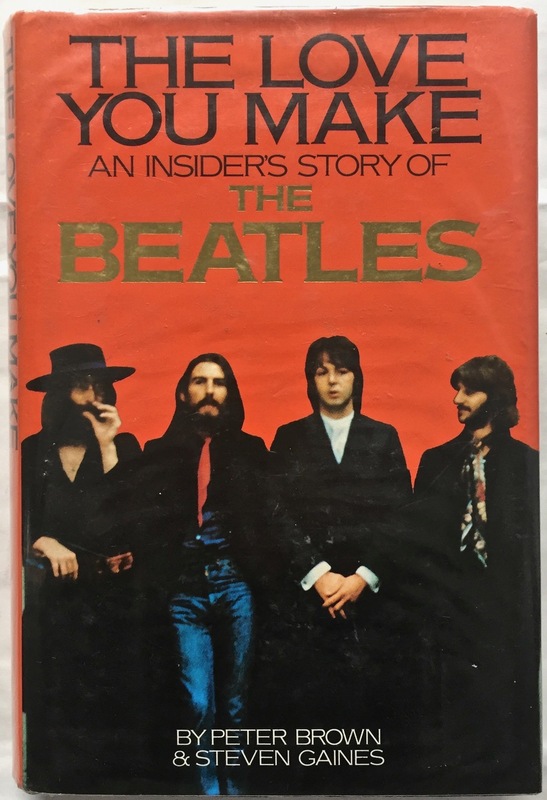 Hammack’s intention here is to fill in the gaps between Mark Lewisohn’s The Complete Beatles Recording Sessions, Andy Babuik’s Beatles Gear, and Recording The Beatles by Kevin Ryan and Brian Kehew. It’s also about how the band’s recording processes evolved as they became more experienced recording artists, as recording technology developed, and as the resources available to them expanded. Jerry has spent nearly ten years now carefully de-constructing each Beatle recording. He does this by listening to out-takes, bootlegs, and original stems containing isolated solos and vocals (which can be unlocked in the video game RockBand). He pores over studio logs to see exactly where the recording took place, who the engineer was, even what tape machines were being used. Then there’s studio film footage and still photography that can also yield up valuable evidence. These things can all give hints as to how each song must have been created. The information can then be logically worked through to make a near-as-can-be definitive picture of what we now hear on the final mixes. Bear in mind that in arriving at his conclusions Hammack cross referenced some 5,500 tracks! These reference manuals serve as a terrific listening companion to use as you sit in front of your speakers, or have your headphones on. With them at hand you can clearly identify what is going on with any given track. 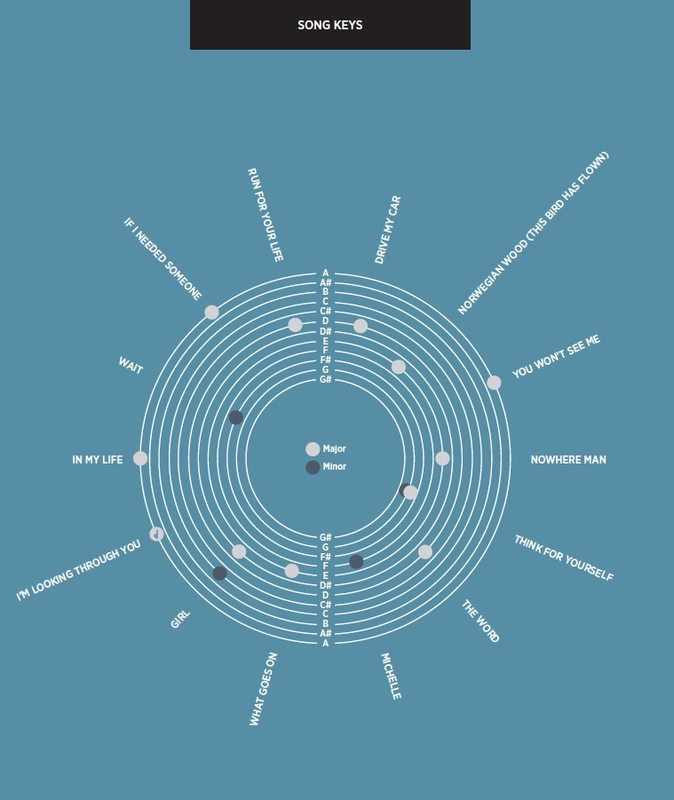 There are both text explanations and simple diagrams detailing what occurred in the studio as each track became the final mixes we have today, and sometimes these contain fascinating new information. I mean, who knew John Lennon played drums on the George Harrison composition ‘I Need You’ from Help!? 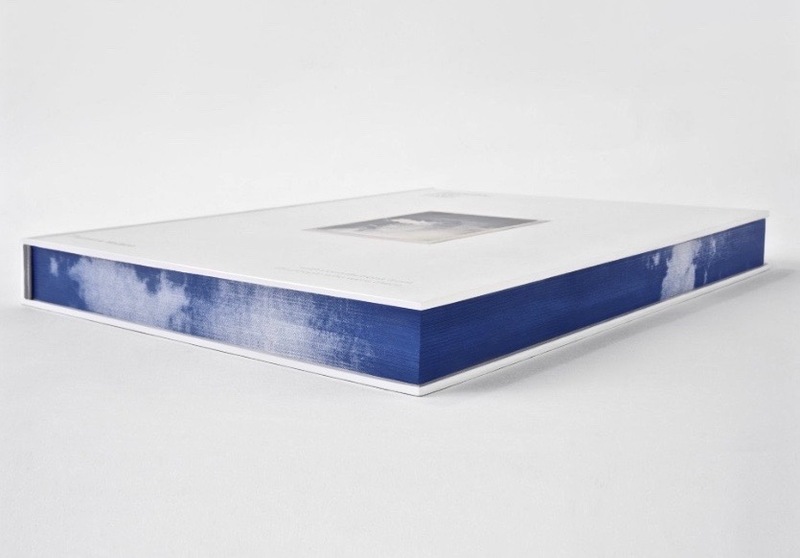 As in Volume 1 there are numerous appendices at the back of the book covering release versions, gear and instruments used, and more. Gotta say too, just in passing, that the cover image for Volume 2 is super cool! Jerry Hammack has created a website to support the book series, and you can purchase his book through Amazon. 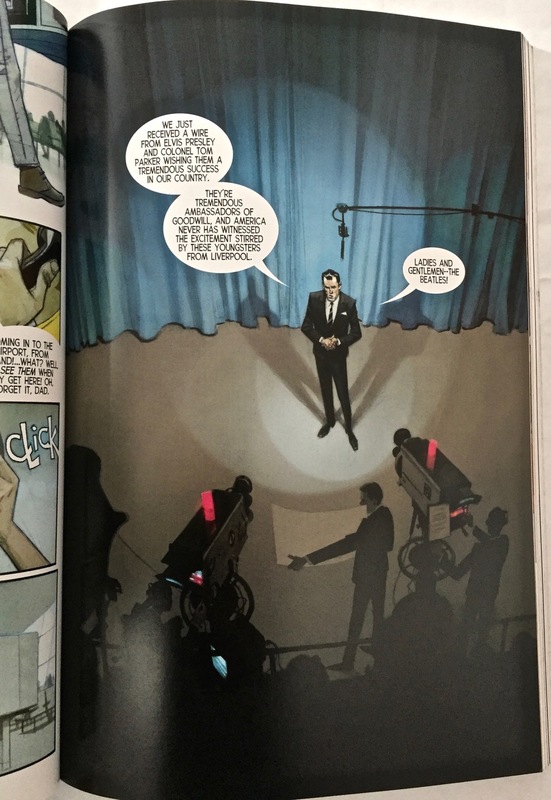 Additionally, the fab Something About the Beatles podcast, hosted by Robert Rodriguez (with Ben Rowling), recently interviewed author Jerry Hammack. It comes in two parts. Have a listen to both Part One and Part Two. Well worth it. Looking ahead, Volume 3 will cover off Sgt. 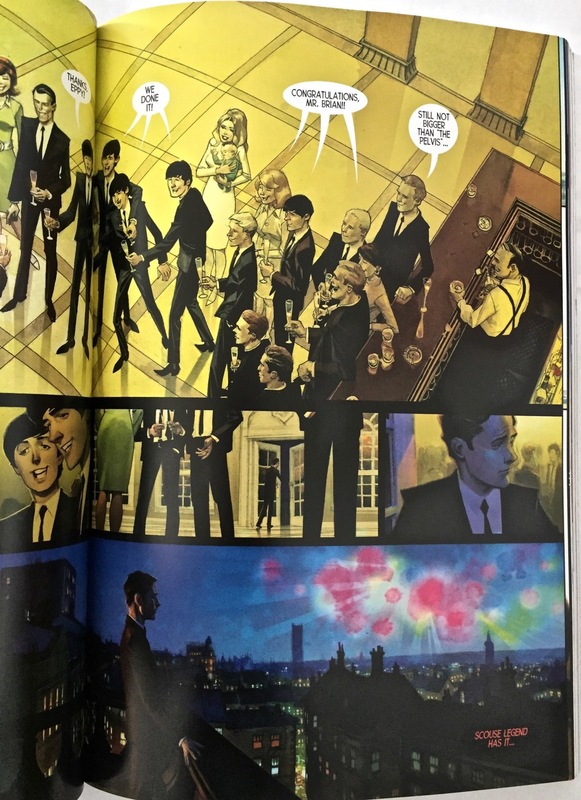 Pepper’s Lonely Hearts Club Band and Magical Mystery Tour, and then the final book in the series, Volume 4, will take in the LPs The Beatles (a.k.a. 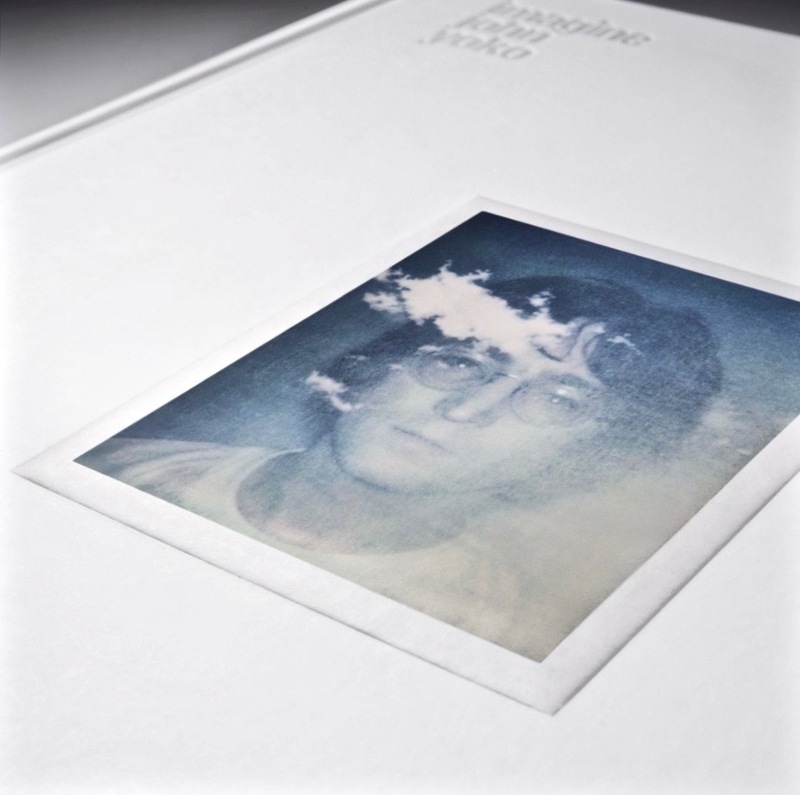 The White Album), through to Abbey Road (1968-1970). The plan is to release each at about 6-monthly intervals. 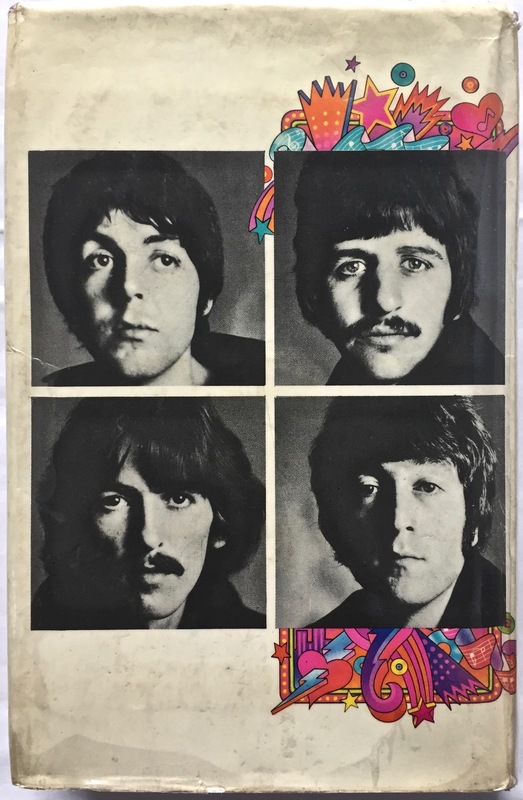 If you are a “gear nerd” or you just want to get the absolute detail, song-by-song, on how each Beatle track was recorded, the instruments and technology used, and who played what, these books are a must. They say there are four basic types of learners: those who like to listen (auditory); those who like to take notes and read (reading/writing); those who like to be hands-on (kinaesthetic); and those who prefer to see the information in order to visualise the relationships between ideas (visual). 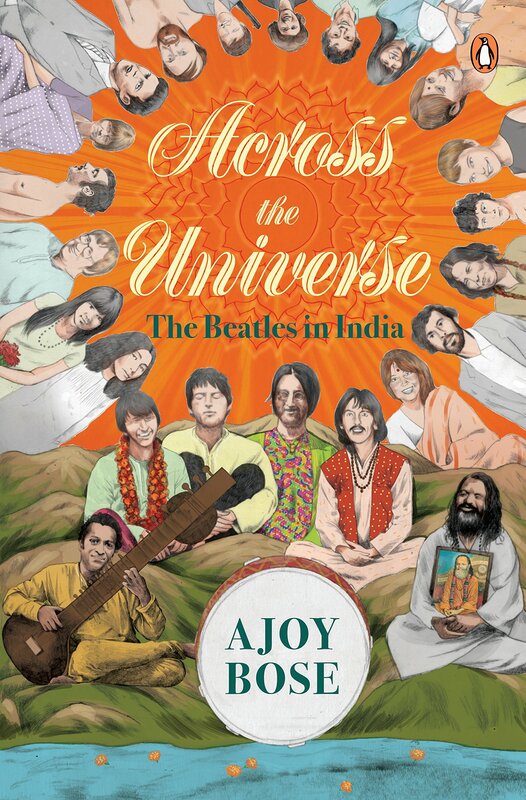 Well, if you fall into the visual camp, then you’re going to love this new Beatle book because on each of its 276 pages it packs a huge amount of data told in a truly unique way: using fantastic infographics. 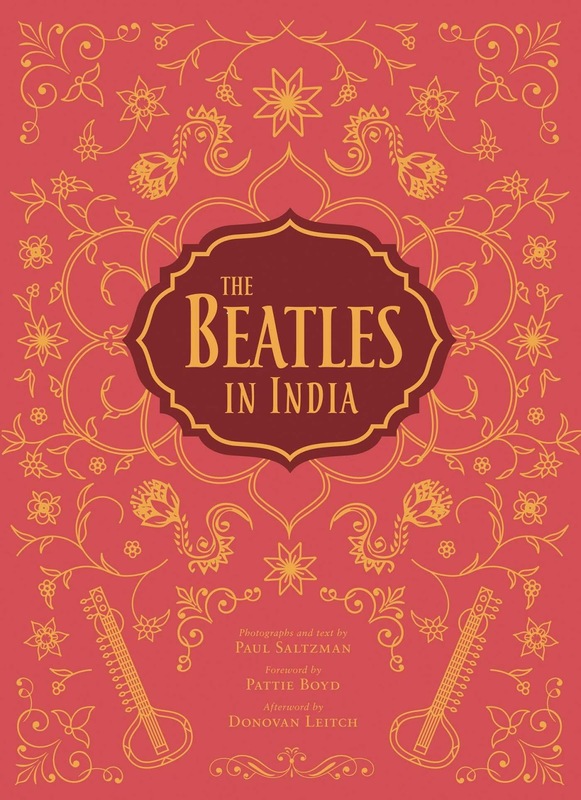 The book is called Visualizing The Beatles – A Complete Graphic History of the World’s Favorite Band. Not only does it mange to squeeze three US spellings into it’s title, it crams a truly amazing amount of facts, figures, maps, history, stories and information between it’s covers – all told using infographics. 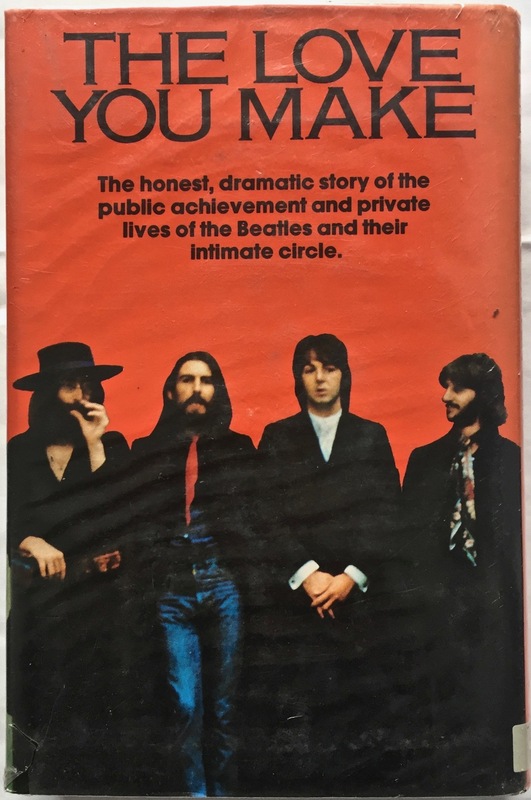 Because of this the book forces you to think about the band we all know so well in very different ways, often bringing new understanding to how four young musicians from Liverpool had such an impact on the world. 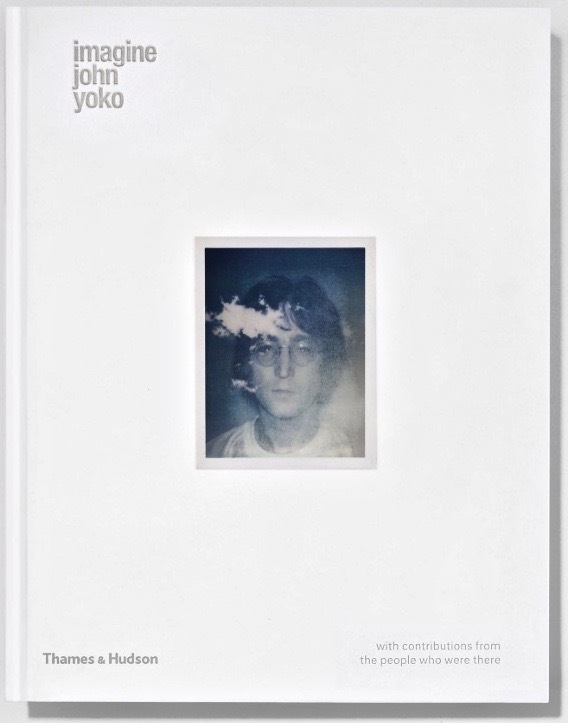 Slowly, as you flip through the book, these images build to reveal a unique way of looking at the band’s output. 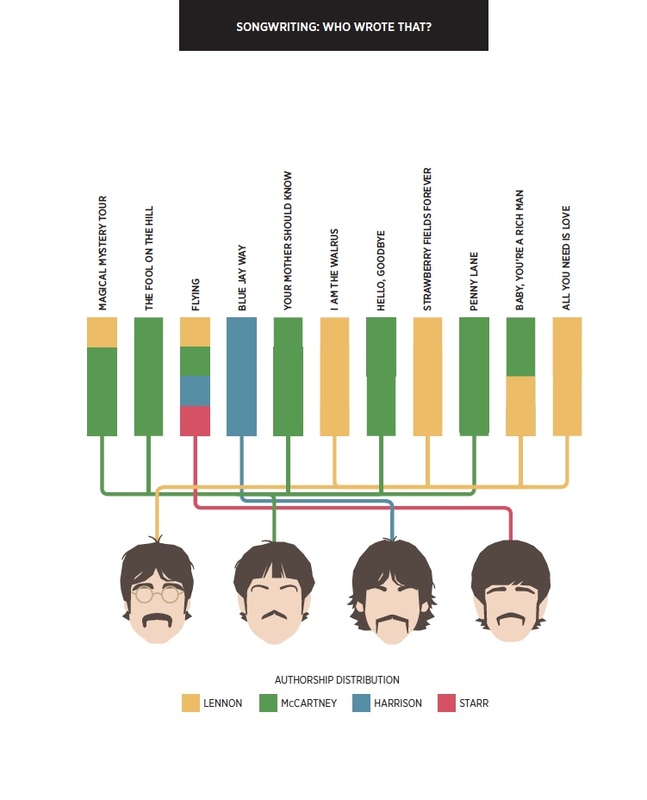 Additionally, there are pages graphically representing things like all their US releases and the chart positions each achieved; a Beatle filmography; there are timelines detailing what else was happening in the world at the time of each album release; what the Beatles were wearing and their hairstyles through each phase of their career; where each album was recorded; tour maps; and key places of interest in the cities they lived in and visited, and much, much more. One particularly interesting map page shows the city of Liverpool with flags dotted across it marking where the band lived in relation to each other; the locations of places like Strawberry Field and Penny Lane; schools and key performance venues from the early days. 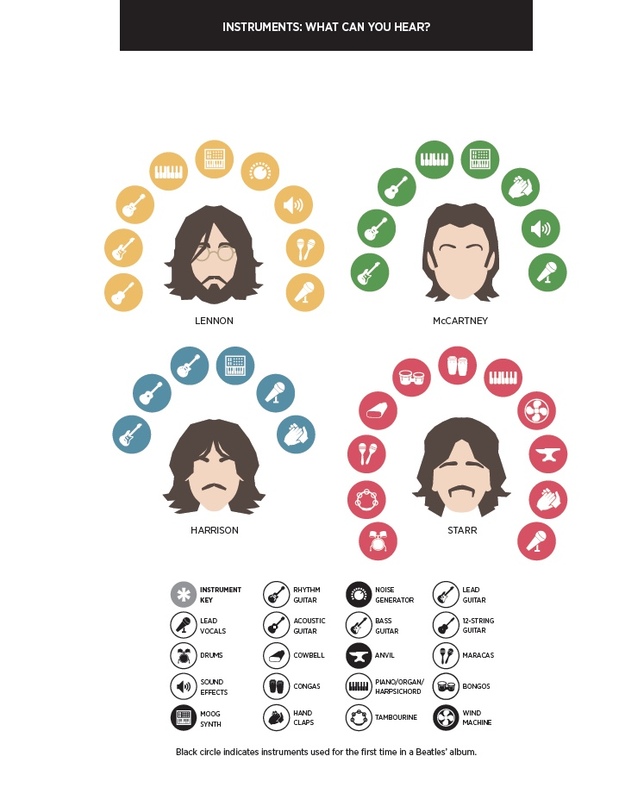 It is simple, but instantly gives a whole new context by visually representing basic facts from the Beatle story in a brand new way. 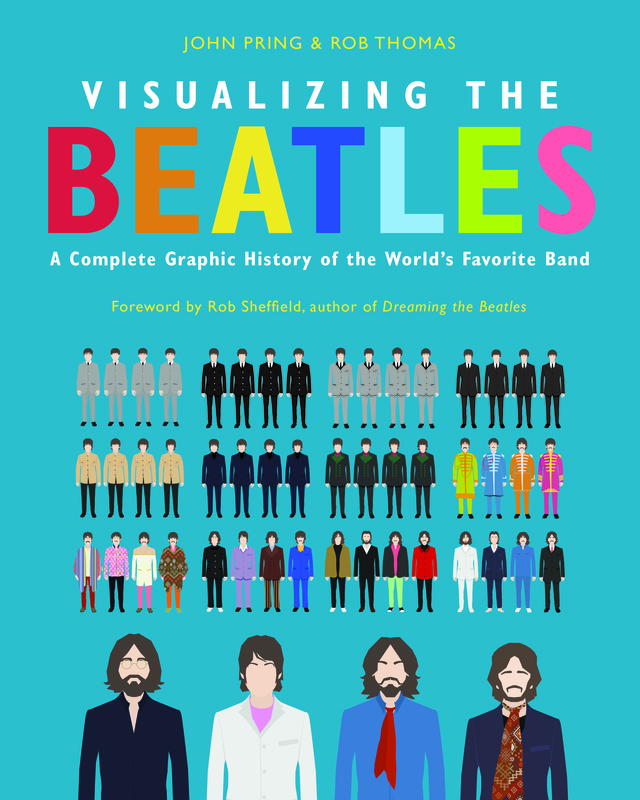 Visualizing The Beatles by John Pring and Rob Thomas is published by Dey Street Books. It goes on sale in the USA on May 1st. 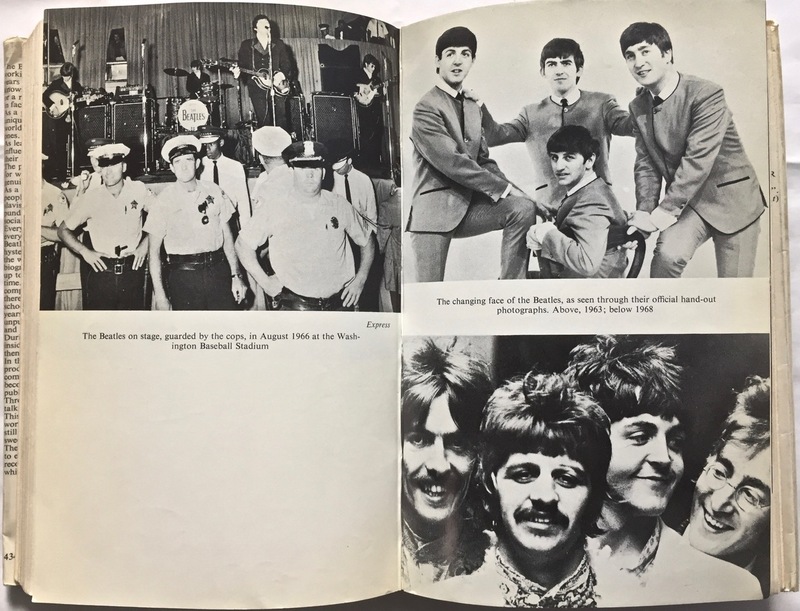 [FYI the book was originally published as Visualising the Beatles in the UK in 2016]. 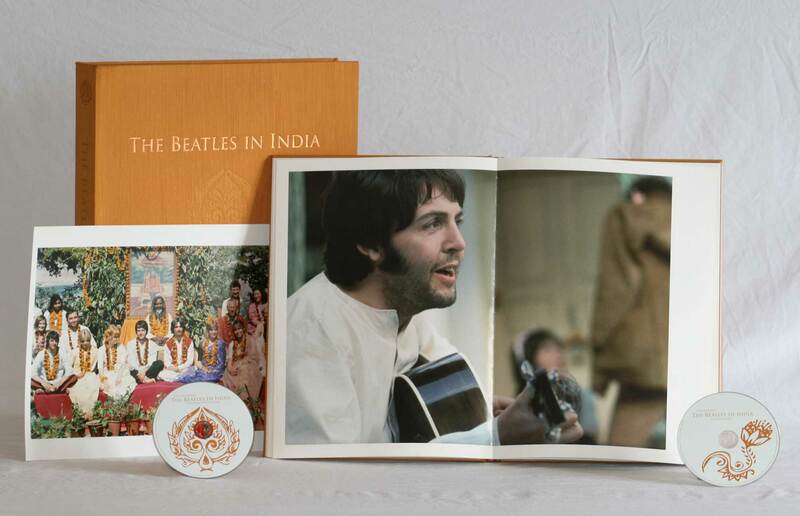 You will definitely learn things you didn’t know about the Beatles. Highly recommended. 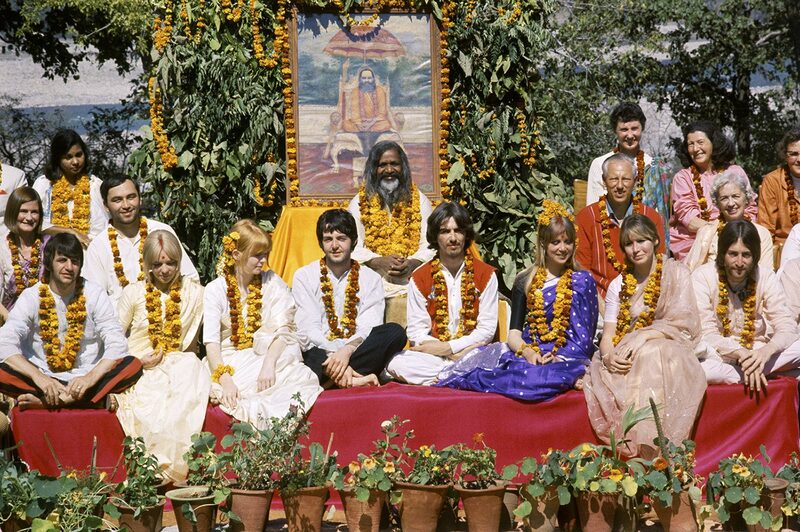 He’s a recognised authority on The Beatles and their enduring cultural influence. 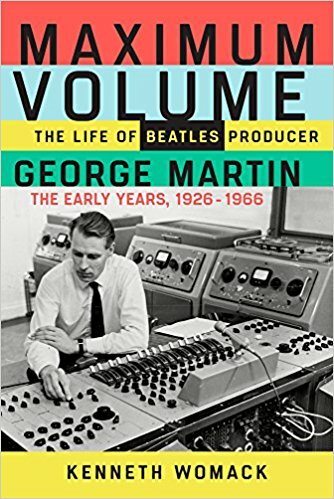 His latest work is the first in what will become a two-volume biography devoted to Beatle producer, Sir George Martin. 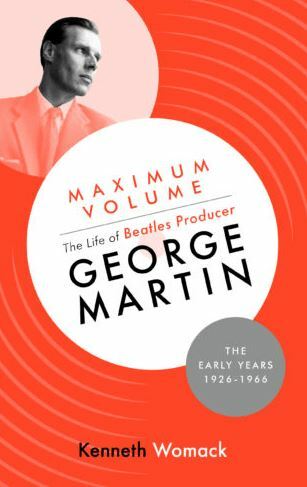 First published last year in the United States, then quickly followed by a UK edition, the first installment is called Maximum Volume: The Life of Beatles Producer George Martin (The Early Years: 1926-1966). This book is long-overdue. There have been surprisingly few in-depth studies of the life of one of the most influential figures in popular music, a career spanning more than 60 years. 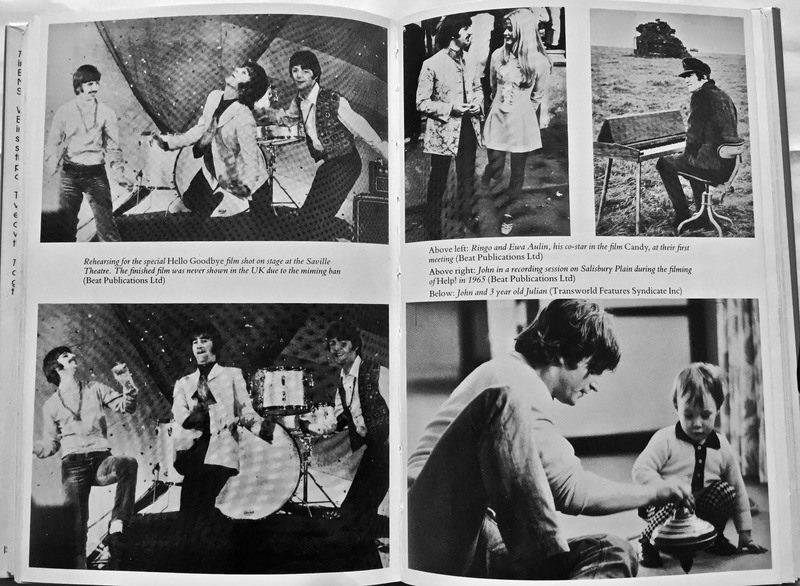 In Womack’s book we learn that George Martin scored his first real job in the music industry pretty much by accident when he joined the recording giant EMI as an A&R man for Parlophone Records and that in the 1950s being in A&R (or Artist and Repetoire) didn’t mean you were a producer – it was more about talent scouting and the artistic and commercial development of the artists signed to your label. Martin had a natural musical talent and great training, and he’d had some success with comedy and novelty records for Parlophone. But he needed more than that. By the early 1960s to keep his label afloat George Martin needed to hit it big with a pop group – and soon. Though he had tons of creativity, drive, and a solid musical background, Martin’s main handicap was that he had little knowledge or experience of the world of Rock & Roll. Then, into his life walks a young, four-piece outfit from Liverpool. These guys knew a lot about Rock & Roll, but had no knowledge about studios and how to record their music. The pairing of the two was a marriage made in heaven. 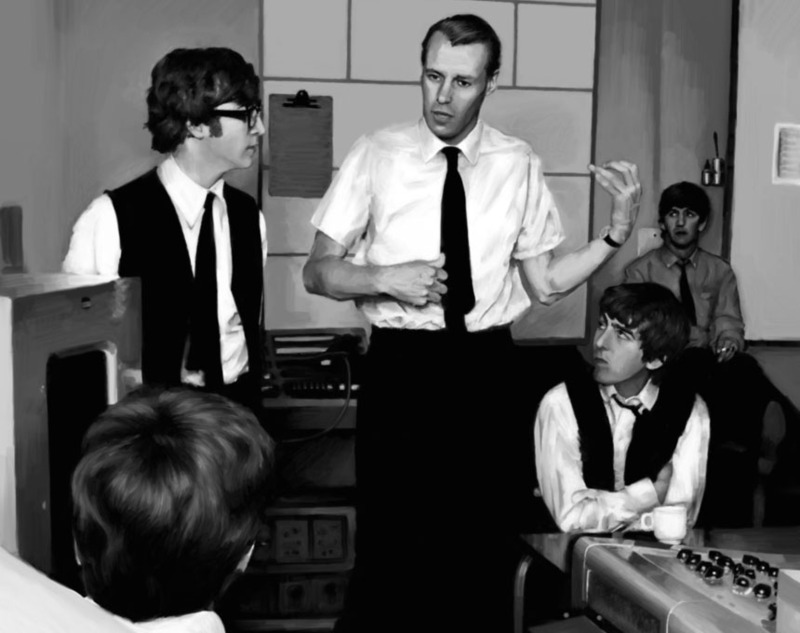 What George Martin was able to bring to the table fitted perfectly with what the Beatles needed – and together they went on to make magic. 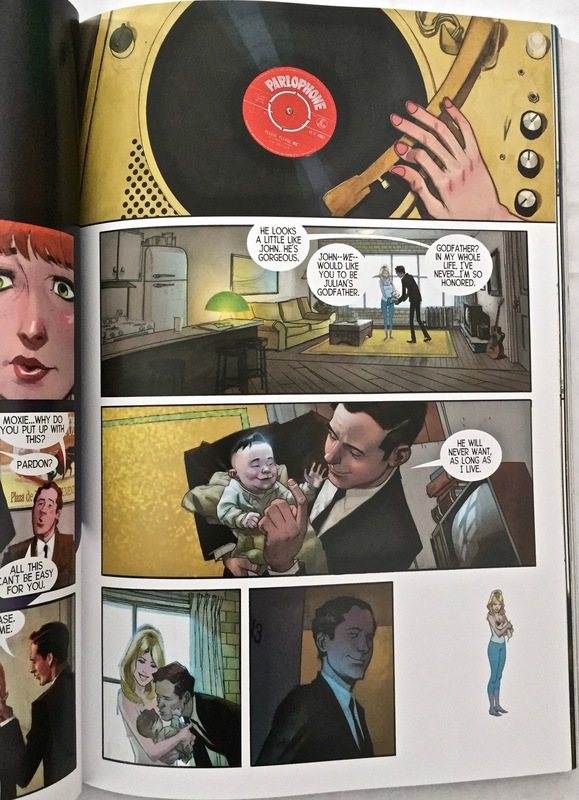 In Maximum Volume Womack candidly – and comprehensively – tells the story of George Martin from his very humble childhood and early adulthood, through to the heights of success he and the Beatles enjoyed globally. It’s a great read, a real page-turner in fact as the detail behind that enormous success unfolds. 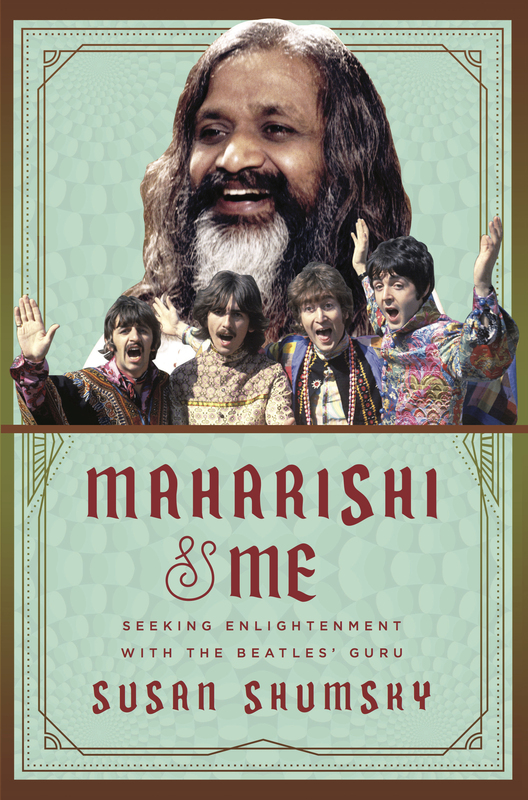 As one reviewer put it, the book contains enough fresh information and informed insight about the group’s early years to satisfy [even] the most devout Beatlemaniac. 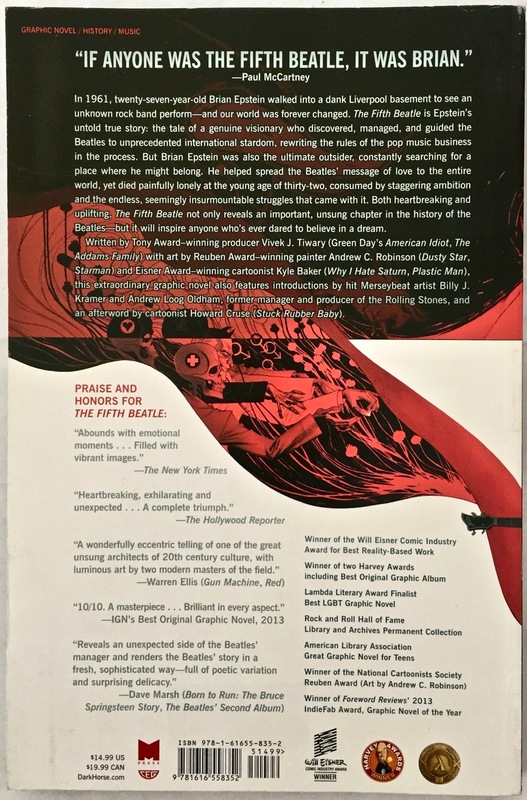 Maximum Volume takes a similar approach to that of Mark Lewisohn’s well-researched and highly regarded multi-volume telling of the Beatles story: there are footnotes detailing where Womack is getting his information and where his quotes come from; there’s an extensive bibliography; and there’s a comprehensive index. All these things point to the thorough research undertaken by Ken Womack and the efforts he’s gone to put the life and work of George Martin into a context that can be supported by facts. 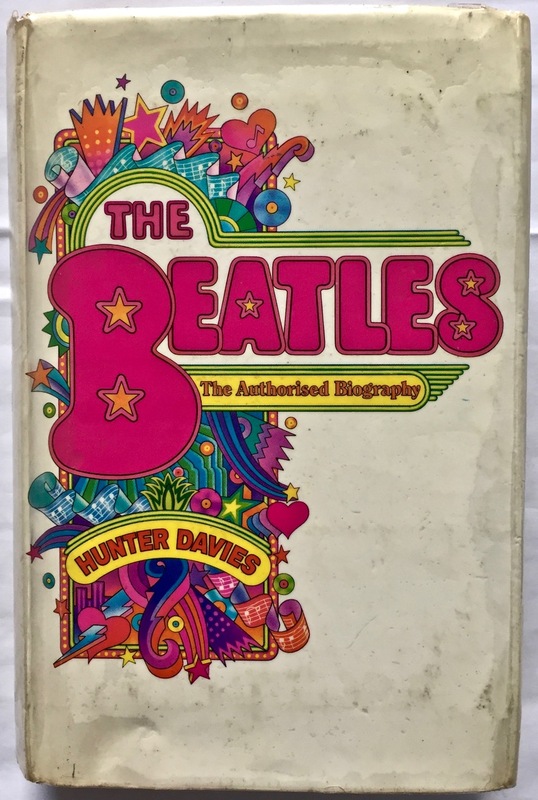 The importance of this approach to writing about the Beatles, or any subject or person for that matter where so much has been written over many years, is imperative. Sifting through the mass of it to find those kernels of truth about your subject before forming it into an accurate and entertaining narrative is paramount – and Womack pulls it off. 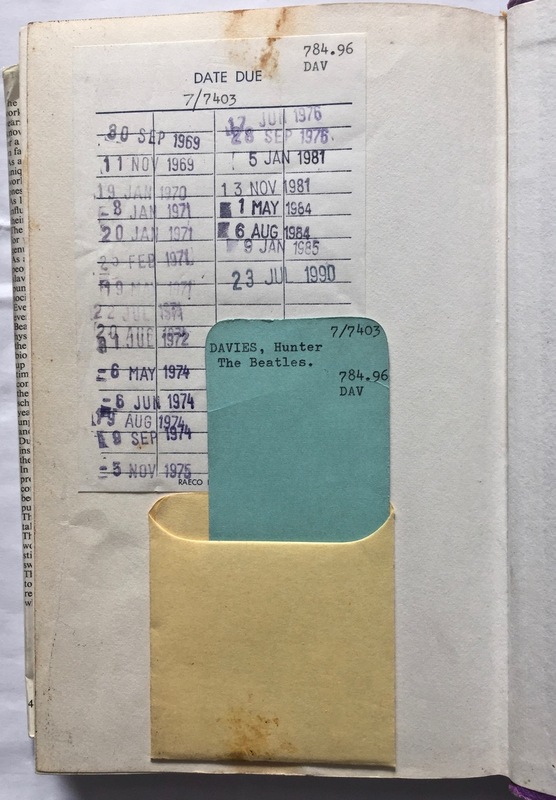 For a great reflection on this subject it’s worth a listen to the Something About the Beatles podcast episode called “The Beatles and the Historians“. 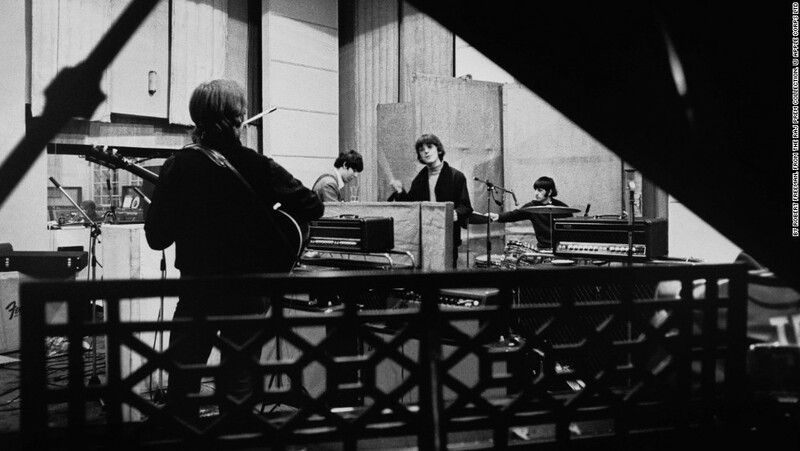 See too the show’s interview with Ken Womack himself: “George Martin – Maximum Volume“. Womack’s second and final volume on the life and work of Sir George Martin will be published in September this year. It’s to be called Sound Pictures: The Life of Beatles Producer George Martin (The Later Years: 1966-2016). In the meantime, enjoy Volume One – Maximum Volume. It is highly recommended.